Some said it couldn’t be done, but the good people behind the famous CyanogenMod just took that as a challenge. This time they are serving up a nice helping of FroYo to all those rooted HTC built T-Mobile Android phones. 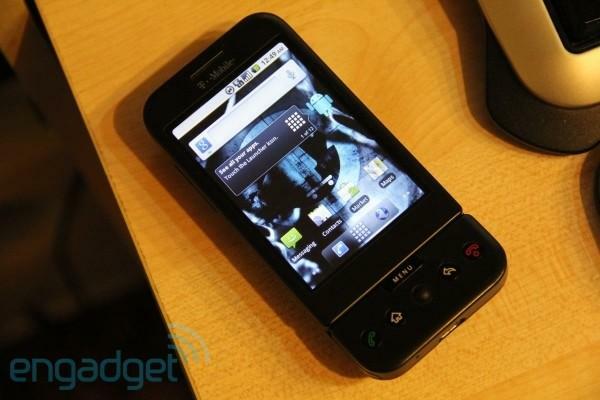 CyanogenMod 6 will run on the G1, the MyTouch 3G and, of course, the Nexus One. This Mod will give you all the rooted goodness, but does have it’s share of bugs (like no Flash 10.1 and force closes in the Android Market). All in all, this is a pretty stable build and might be the way to go. Saying that there hasn’t been very many updates regarding FroYo on the G1 and MyTouch, this may be your only answer. As always, proceed with caution and leave your thoughts in the comments! ← T-Mobile Closing Its Doors In 2011? Not So Fast! I am running froyo right now. Flashed it yesterday and still haven’t had anything FC on me. Things are missing but it does have most of the features. I think there is going to be plenty of stable builds of 2.2 soon. Just give it time and maybe hey will find a way to get everything. But it will be the last update for the g1. There seems to be a few bugs with 6.0.0-RC1 mainly the market not syncing correctly and app2sd not working properly. So anyone not on the up and up I would suggest waiting until the stable client is out hopefully later this week or next. The market has been fixed, visit Cyanogen’s thread for CM6 for the fix. Also APPS2SD works fine, its just Google added a new implementation of Apps2sd so APPS are now stored onto your FAT32 and not EXT. That’s good to hear 1, but for the newbs, Technogen’s advice is sound, wait for a totally stable release is posted by the author (OP). And whenever there’s issues, I always look for what the developer (author of the post, or the original poster) has to say about the problem. Also, and from experience I know this falls on deaf ears, the author accepts donations. So if you find his stuff useful, don’t forget to send a PayPal donation. By tradition $5 is minimum, $25 will get you a personal “thank you” from the author. 1. The G1 has a complex rooting process. Perhaps it has been made easier than when I did it back in February 2009, but in any event, the procedures are not for the faint of heart. 2. So something wrong, yes, you can brick your G1. 3. I can tell you confidently, not because I am a member, that XDA is for people who know what they are doing. Installing this on your G1 is NOT as simple as installing an app that you might download from Android Market. XDA is NOT the place to ask questions if you don’t know what you are doing. Ask a newb question you will be ignored or some members will slap and insult you. 4. As Technogen says, there are some bugs reported. IMHO they are MAJOR bugs. Market is not working. Also Apps2SD (if you don’t know what this is or if you think it has something to do with BlueTooth stereo, close this thread a forget about putting 2.2 on your G1. 5. I would do this ONLY if the G1 is on display on your cell phone museum shelf (aka it’s not your primary phone). I am going to fool with this because I am keeping my G1 as a personal “museum piece” since I will always treasure it as the first Android phone. I will also use it as a backup phone in the event I lose one of my primary phones. This is a good idea for you too if you are totally wireless at home (meaning no land line). 6. Remember that this is NOT a final release, it’s more of a beta. So don’t install it thinking your phone will be flawless, it’s expected to have bugs. Bonus Tip: A great place for getting the easy “how-to” on all this is YouTube. The quality of the videos vary, so search for one that helps you the most. And sadly, you now have to beware of the scam YouTube videos that supposedly show you how to install things like this. But what they do is take you to a sight that tries to market you junk, magazine subscriptions, insurance, etc. E.g. a recent one was supposedly Android running on the HD2. Was a total scam. Nice write up except for the fact that G1 remains the simplest phone to root up to date (except for N1 of course). Apps2SD is bug free and simpler then its once was, it is using a new method. Market is working just fine. There are NO major bugs. Few minor ones – yes, major – no. I installed it on my spare G1 to see what its all about and I honestly say that its running better then Eclair ever did on G1. Ready to update my daily driver G1 to it. Michael, do you use Rom Manager? After I select Wipe, the phone reboots (as it should) but only the G1 flash screen shows and I then have to take out the battery. I also agree the developer threads are not very helpful for newbies. question averted. tried rom manager again and now it works. wow! the G1 is blazing fast now (relatively speaking). Wow it’s nice to know the xda geeks will slap and insult you or asking a question. Makes me want to stear clear all together. Wow it’s nice to know the xda geeks will slap and insult you for asking a question. Makes me want to stear clear all together. Wait, the guys at XDA have always been more than helpful to me. I’m totally clueless on all this stuff, but they showed me how to do all kinds of things. I’ve never been slapped, and even my dumbest questions weren’t ignored. They helped me flash my Excalibur (Dash), Herald (Wing), Rhodium (Touch Pro2), Maple (Dash 3G), Leo (HD2), and even my Espresso (myTouch Slide). XDA is a bunch of stuck up dorks that have entirely too much time on their hands. Not sure I agree with most of what you are saying… Rooting is NOT hard at all if you know how to follow simple instructions. Also, Cyanogen and the rest of the community did a great job adding features for backup when upgrading. I had a few issues when moved to 6 but restoring the backup was cake and solved all of my issues. I’ll be converting back to 6 tomorrow. I base my XDA comments on what I have seen there and the hundreds of people who contact me on YouTube (in my How-To Flash) videos who tell me that they went to XDA asking for help and got chased off. Yes, if you know what you are doing and can talk the talk, then XDA will treat you fine. But go in there unprepared they will ignore you and/or someone will flame you. XDA is trying to moderate more nowadays and will chew out someone, usually a senior member, who is rude and insulting to newbies. But staff will remind newbies that the Site is for the developer community, not a How-To site for one and all. As to rooting, on my one G1 video on resetting, it has received over 108,000 views. That is somewhat indicative of just how many pleas I get from people every day asking for help on the most rudimentary procedures (other than resetting the G1). Market has been fixed, updated GAPPS package on both forums! Should also note that no flash is not a “bug”. It will never work on G1 or Mytouch unless Adobe chooses to release a version compatible with ARM6 processors. I saw it reported either in here on TMOnews or on Phandroid that MyTouch 3G will be getting Froyo. Why is it being lumped in with the G1 now ? The MyTouch 3G WILL be getting the official Tmo Froyo next month. This is NOT that. This is a community made ROM. In the ROM community because the original MyTouch 3G (the one without the 3.5mm jack) shares the same board and CPU as the G1, ROMs made for one work on both, that’s why it gets “lumped” with the G1. XDA can be pretty dooshy I first go to androidspin first usually they have written instructions for flashing ROM’s what you need to do, requirments and whatnot. First release of things are pretty buggy with a lot of things not working or partially working but just wait a week or so and they’ll fix it slick as snot.. Running Superbad right now but I’m getting the Vibrant next week so I’m cool with what I got.. So much for google saying the G1 wouldnt be able to get Froyo, more likely they didnt want to do it! The G1 with its original SPL cant be upgraded to froyo. There just isnt enough memory allocated to the OS. The Mytouch has a different SPL than the G1. When you upgrade your Rooted G1 to froyo one of the first steps is to replaced the SPL with one based off the Mytouch. If you dont know what an SPL is its like the BIOS on a computer. Its the software that allows your hardware to run the OS. Im not sure if its possible to update an SPL over the air but there is one thing I can tell you from personal experience. Even manually replacing the SPL has a high risk of bricking your phone. Im sure Google and T-mo just dont want the extra liability of replacing half the G1’s on the network. So no I dont believe Google had a lack of interest in updating the G1. And yes, SPL modding is dangerous. It’s worth it to follow the directions TO THE LETTER to get the engineering SPL so you have fastboot access, IMO. But I wouldn’t do Danger SPL if I were starting now. Not to mention, it’s Linux. They could modify the init script to mount /cache as a directory in /system to free up some room. Froyo doesn’t seem to use /cache for anything, so you would lose nothing. Storing dalvik-cache or /system/app there would free up a LOT of space. Well just finished watching a video on YouTube about windows phone seven. Ididn’t think i would say but its kind if nice. the xbox live concept is quite nice. if u guys get a chance check it out. search for it. I know what you mean. When I dumped my MDA running WM5 for a MyTouch, I said that I would never own a Windows phone again. But that Win7 for phones sure looks sweet. So far so good with CM6 on my G1, but I am seeing the above-mentioned force closes in the market. Usually occur right after installing software. One disappointment, I didn’t get my apps back and my nandroid backup won’t restore. So I’m having to reinstall everything manually. With a crashy market. Fun! Install the v3 gapps pack. The market is fixed now. Titanium Backup, well worth the $5 or so. Totally automated re-install of all my apps including their data. apps2ext doesn’t work in froyo, yet, so you do need to re-install. No need to do it manually though. Even the non-paid Titanium Backup will restore them quickly, but you have to confirm each app as you go. Much faster than without it though. Phillp, have you turned JIT on? It is disabled by default. Go to Settings, Cyanogoen Mod settings, and turn it on in there. Thanks Vert, I had no idea either about how to turn on JIT. xda developers is awesome, just read the threads and don’t clog them up with questions that have been answered already. that’s what the forums are used for…to ask questions. that was a really weird and bizarre comment (in other words, stupid.) as difficult as it is to read those thread, maybe asking twice is appropriate. so does the new cm6 and gapps fix the stuck on “starting download” issue?? anybody know ? I have a mytouch and I will settle for android 2.0 :) Just give us something! SINCE we are on the subject of rooting, I have aquestion or two maybe some of you can help me with. I just got a mt3gs, and I am still using my original mt3g as my at work phone. I fooled around and put windows 6.5 on my t-mobile dash(not the dash 3g) and was wondering is rooting anything similar to flashing a wm phone? Question 2: if I were to root my mt3g, how would I go about finding the software needed to do such a thing? And finally, question 3: would it be smarter to just sit on my mt3g and wait for an offivial 2.1 update? Answer 1. Dont know never messed with a winmo phone. Answer 3. Mytouch will not get the official 2.1 it will recieve the official 2.2 whenever they get around to it. @ItsMichaelNotMike, regarding the rooting of the G1…. I’d never done anything other than use a blackberry for the last 10 years or so and I really didn’t have much trouble rooting and installing a mod on a G1 I bought just for the helluvit a couple of weeks ago. Anyone that can follow instructions and has a pair can do it. market issue was fixed within about 12 hours of the rom’s release. I am running Froyo 2.2 – cm6 but the only thing is missing is Adobe Flashing capabilities other than that is the best rom by far that U use in my opinion. Went through the process last night. If you’re at all interested in things like your phone’s OS version, you’re most likely already the kind of person who can get through this process. 99% of phone users don’t read blogs about their phones, and you’re right, those people probably shouldn’t try this process… but they’re also not likely to even realize it’s an option. As for the complexity, if you can read directions, you can get through this just fine. The steps are basically several iterations of formatting your card, dumping certain files on the card, rebooting with various key combos, and in the end you’re running CM6/Android 2.2. It took me about 45 minutes yesterday, and I’ve never bothered to root any phone before. The only things that are missing from the instructions are a note to use CM6-RC1 instead of CM5. Everything else — just follow the simple, clear directions on two Wiki pages. Simply put, 2.2 is amazing compared to any of the 1.x versions. Well worth your time and effort if you’re interested. And like others have noted, the UI is faster and more responsive, and so far RC1 seems rock-steady to me. Good morning, all…after installing Froyo on my G1, I did notice that the Market was not working. But there was something I did, and for the life of me, I can’t remember what it was, but I did get the Market to work. I thought it was because I installed Google Apps after flashing the Cyanogen Mod to my G1…when I get it figured out, I will post another comment. Is anyone else experiencing touchscreen issues?! i have the Mytouch 3g (the one without the regular headphone jack.) as soon as i upgraded they started! my screen wont recognize when i touch it, and i have to sleep the phone for me to get minimal usage out of it. i downgraded back to 5.0.8 and the issue still persists. the phone is almost non-functional. HELP!!!! Also im thinking about the Mytouch Slide or the Vibrant as an upgrade. which one is better?